Those of you out there who appreciate my work and wish to contribute whatever you can financially so that I can continue to pursue this line of research and inquiry can now do so. It takes quite a lot of effort and time to do what I have been doing — researching, writing, broadcasting, etc. Due to the sensitive and controversial nature of what I generally write about and discuss, it is nearly impossible for me to attain any kind of stable income from my work. No mainstream media outlet would ever get within a mile of what I highlight on a regular basis in my writings. Not that I would want to work for the sell-out, corporate media anyway, but it is extremely difficult to make a decent living in journalism outside of that system. Most alternative media outlets simply don’t pay enough (if anything at all), and at the end of the day, one needs money to survive. Thus, I must seek reader funding to continue my efforts to shine a light on the darkness engulfing the planet, wherever it happens to emanate from. To contribute either click the button below or send the funds to martinezperspective[at]hotmail.com on PayPal. Thank you for your time, consideration and interest in what I have to say, and most of all for keeping an open mind. On this episode of The Martinez Perspective, host Brandon Martinez is joined by independent writer and researcher from Sweden, Lasse Wilhelmson. Why do so few people know about the true histories of Bolshevism and Zionism? Why is there so little discussion of these movements, despite their integral role in shaping the 20th and 21st centuries? Could it be that both movements have Jewish origins and therefore receive soft treatment from historians, academics and the media? The destructive and murderous legacy of Bolshevism in Russia is seldom brought to the fore in mainstream discourse, yet we are fed a constant stream of messages and images about what happened to Jews during the Second World War. Marxists and communists today have an extreme intolerance towards WW2 and holocaust revisionism. “How dare you question what the winners have told us about WW2″ the communists say. Yet, these same ideologues are extreme revisionists when it comes to the history of the Soviet Union and other communist states. Most of them openly deny the millions of victims of Lenin, Stalin and Mao. Some even deny the Gulag existed in the USSR and call the Holodomor — Stalin’s engineered Ukrainian famine genocide — a myth! Wilhelmson discusses all of these issues from a unique insider’s perspective. In his youth he was an avowed Marxist and comes from a Jewish background. He was a political activist for years and took part in various left-wing causes. After doing his own research, Wilhelmson abandoned both Marxism and Jewish identity, and has become an outspoken critic of Israel and Zionist power. Martinez and Wilhelmson delve into the hypocrisies of left-wing ideologues and much more on the show. Consider contributing if you wish to hear more interviews like this one. The mainstream media is in a frenzy over anti-black comments made by the owner of the Los Angeles Clippers NBA team, Donald Sterling. In a taped recording recently released by the tabloid TMZ, Sterling is heard arguing with his girlfriend (a 30-something model named V. Stiviano) and making what the media is calling racist remarks. He tells his girlfriend not to bring black people to his games and not to associate with blacks in public entirely, even though she happens to be part black herself. It appears that Sterling views the NBA players he employs much like circus animals putting on a show. “A hundred percent,” says Sterling. The most interesting aspect of this incident is the way in which the Western media has covered it as opposed to the Israeli and Jewish press. Israeli and Jewish-oriented American newspapers have made no bones about highlighting Sterling’s comments about blacks being mistreated in Israel. 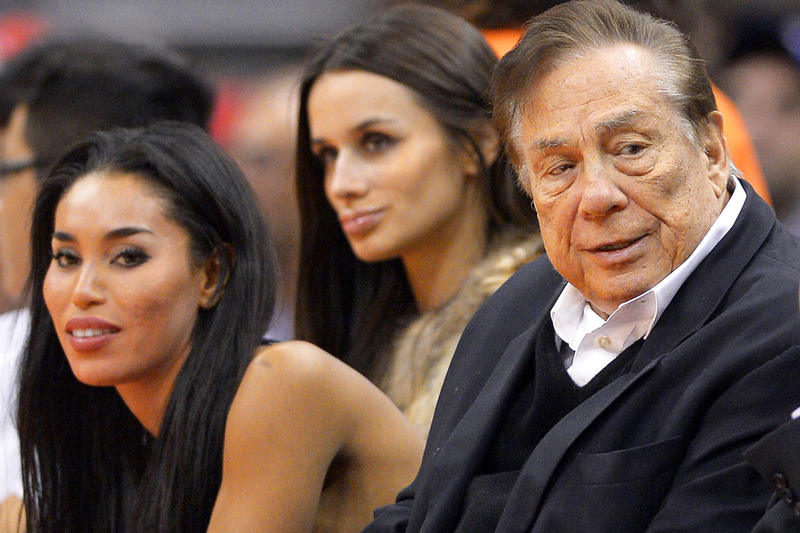 The Times of Israel ran the headline, “Clippers owner: Black Jews treated like dogs in Israel.” Articles in Haaretz, the Jewish Forward, the Jewish Telegraphic Agency, and other Zionist outlets carried similar headlines and stories focusing on Sterling’s Jewishness and his reference to the inferior social status of blacks in Israel. However, mainstream media outside Israel and the Jewish community for the most part failed to note Sterling’s Jewish roots and in most instances kept out the part of the conversation where Sterling invokes Israeli racism. Many suspect Jewish editors and media execs are running damage control for Israel, hoping to hide the reality that Ashkenazi Jews in Israel discriminate not only against Arabs and Palestinians, but blacks too. Philip Weiss, an American Jewish blogger, said that during his long career in journalism “Jews have made up the majority of the important positions in the publications I worked for, a majority of the writers I’ve known at these place[s], and the majority of the owners who have paid me.” Weiss even cited a few examples of Jewish media executives and editors using their power to influence coverage in favour of the tribe, such as the former New York Times chief editor Max Frankel, who admitted in his memoir that he was “deeply devoted to Israel” and shaped the paper’s Middle East commentaries “from a pro-Israel perspective.” “I was much more deeply devoted to Israel than I dared to assert,” Frankel confessed. Another example Weiss noted was when former NBC chief Jeff Zucker stopped broadcast reporter John Hockenberry from doing a story about the true motivations of the alleged 9/11 hijackers because one of their motivations was US support for the apartheid and bellicose Zionist state. Is Sterling’s assertion about blacks in Israel true? Rabbi Eliyahu Fink, in a column for Haaretz titled “The ugly truth behind Donald Sterling’s racist comments,” admitted: “Too often, white Jews do treat black Jews poorly. We do have a bit of a race problem in our communities.” Fink noted that “Ashkenazi bias against Sephardic Jews is common” and that Jews in Israel live in insular communities. Jewish journalist Max Blumenthal wrote a book entitled Goliath: Life and Loathing in Greater Israel, within which he exposed the Israeli government’s program to herd African asylum-seekers into what some would describe as concentration camps – a temporary solution for Israel’s desired policy of all-out expulsion. In 2012 the Netanyahu regime began deporting thousands of Africans back to their home countries. In a video called “Israel’s New Racism,” Blumenthal and activist David Sheen document numerous violent race riots targeting blacks across Israel. Blacks are attacked and beaten by mobs of racist Jews who call them “infiltrators” – a term which Israeli government officials also use to describe African refugees. The race riots were kick-started when Israeli parliamentarian Miri Regev publicly declared African migrants “a cancer,” a sentiment that 52 per cent of Israelis actually agree with according to a poll conducted by the Israel Democracy Institute (IDI) in 2012. This sheds a whole new light on the disingenuous message of “tolerance” and “anti-racism” emanating from powerful Zionist lobby groups such as the Anti-Defamation League of B’nai B’rith. The two-faced supremacists who run that group rally against organized white supremacy in the US (KKK, Aryan Nations, NSM, etc.) whilst defending Israel’s racist policies and practices at the same time. The Jewish chauvinists of the ADL and similar groups are not opposed to genuine racism or supremacist ideologies on moral or humanitarian grounds – they merely view white racists as competitors and rivals on the supremacist battleground. The indefatigable Joshua Blakeney (journalist/radio-host) picked David Cole/Stein’s brain on a great new interview with the elusive Jewish holocaust revisionist turned “Republican Party Animal” turned holocaust revisionist. David Cole, also known under the alias David Stein, was a prominent holocaust revisionist researcher who received a great deal of notoriety for his work back in the 1990s, appearing on the Montel Williams Show, the Donahue Show, and other mainstream media venues to discuss the issue. After receiving serious death threats from the Jewish Defence League, a Jewish supremacist group known for terrorist plots and thuggery, Cole recanted his revisionist conclusions and went into hiding for more than a decade. Last year Cole/Stein was “outed” by an ex-girlfriend, and revealed to be a well-known party organizer for right-wingers in Hollywood. In addition to organizing boozing bonanzas for conservative Hollywood big-wigs, Cole/Stein acted as a consultant on mainstream holocaust films (strangely enough), which Cole, in this interview, described as “pure hokum.” “I didn’t believe any of it,” Cole said of the films he reluctantly helped produce under his kosher persona David Stein. Due to his heretical past, Cole/Stein was cut loose by most of his friends and ostracized by his hedonistic Hollywood peers. But now Cole is back with a vengeance, re-orienting himself on the truth-seeking path. With a new-found zeal, Cole said he now has “nothing to lose” and affirmed his dedication to the revisionist cause. “I’m in it for the long haul,” he said. During the interview, Blakeney queried Cole about his relationship with pseudo-skeptic opportunist hack Michael Shermer, who Cole described as an “unscrupulous, mercenary and dishonest man.” “If Michael Shermer said water was wet, I would want a second opinion,” Cole said. Cole intends to release taped phone conversations with Shermer from the 1990s, wherein the vain glory-hound admitted that the official account of the holocaust contains many holes, despite publicly defending and buttressing the orthodox dogma seemingly for monetary gain. Highlighting the plight of the perennially persecuted German-Canadian revisionist Ernst Zundel, Cole emphasized the victories of the revisionists during the 1985 and 1988 Zundel trials in Toronto. Cole recounted an amusing story about how he edited a film about Zundel and other holocaust heretics in the studios of Fox News. The film is called “El Gran Tabu” and was featured at a Mexican film festival in 2007. Cole recounted many more fascinating stories and anecdotes of his journey for historical truth while Blakeney noted the interesting correlation between the 9/11 truth movement and holocaust revisionism, pointing out that both causes face the same beguiling and dishonest opponents who seek to “pathologize the skeptics rather than deal with the substance of our arguments,” Blakeney observed. David Cole is the author of a new autobiography entitled Republican Party Animal, which he described as a “stridently revisionist book.” It will be in stores across America in spring 2014. He blogs at http://www.biginfidel.com. The Martinez Perspective Ep. 5: Vladimir Putin — Moral Actor or Machiavellian Realist? On this episode of The Martinez Perspective, host Brandon Martinez is joined by journalist and radio host Joshua Blakeney. The focus of this discussion was the dogmatism of the Left, how ideologues discard facts and truths that do not coincide with their ideology, Zionist militarism, neocon wars and the role of Vladimir Putin’s Russia in world affairs. Is Vladimir Putin a “hero” as some anti-Zionists view him to be? Is he a moral actor or a Machiavellian realist motivated purely by self-interest and economic considerations? Martinez and Blakeney discuss and debate Putin’s motivations and whether or not the view of Putin as “good guy” is parochial and superficial. They also discussed the merits and drawbacks of realism vs. idealism and the dichotomy of being an activist vs. an intellectual. Should we prioritize certain independence struggles over others? For example, is the Chechen struggle for self-determination from Russia fundamentally different from that of the Palestinians? Should we place some victims of imperial governments above others in a quasi-caste system of victimhood? And how is that compatible with a moral universalist outlook? All of these interesting concepts and ideas are discussed on the show. Don’t miss this one! Here are a couple documentaries giving a good overview of Russian actions in Chechnya and the origins of the conflict. Russia’s military actions in Chechnya are disgraceful, barbaric and cruel, but relatively prototypical of a big power seeking to dominate smaller, weaker states and subjugate their people. Anyone who defends Russia in this regard is nothing less than an advocate of mass murder and military occupation. A controversy is swirling in Australia involving a former foreign minister and the country’s influential Zionist lobby. Bob Carr, who served as Australia’s foreign minister in the administration of former Prime Minister Julia Gillard, recently published a memoir detailing his experiences on the job. In the book Carr hones in on the Israeli lobby, which he says has “extraordinary” and “unhealthy” influence in Australian politics and had a “direct line” into the decision-making processes of the Gillard administration. Not only is Organized Zionism’s grip on Australia unhealthy, it is dangerous and corrosive. In recent media interviews Carr has said that Gillard overruled his suggestion that Australia not block the Palestinian bid to attain upgraded ‘non-member observer state’ status at the United Nations in 2012 and that this was a direct result of the Zionist lobby’s pull on the former prime minister. Carr also revealed that Gillard was so immovable in her pro-Israel partisanship that she impeded him from making routine statements of concern about the growth and expansion of illegal Jewish settlements in the West Bank because it would upset the Zionist lobby. When asked by ABC (Australia) reporter Sarah Ferguson how such a small group of people could wield so much power, Carr mentioned the significant amount of political campaign donations stemming from Zionist sources as well as the Zionist lobby’s courting of Australian politicians and journalists by sponsoring all-expenses-paid-for trips to Israel. Carr accused Gillard of “subcontracting” Australia’s foreign policy vis-à-vis the Middle East to her wealthy Jewish backers. In 2013 Gillard received the Jerusalem Prize for her unwavering support of the Zionist apartheid state and its terroristic policies. Members of Australia’s main Zionist groups praised Gillard for her “ongoing support of the aspirations of Israel’s people” and noted that she “empathises with the Jewish people and our connection with the land of Israel.” “[T]he Zionist movement of Australia are honoured to be able to demonstrate our gratitude and respect for Ms Gillard’s many years as an unstinting supporter of the Jewish and Zionist cause,” said Sam Tatarka, president of the Zionist Council of Victoria. Gillard unveiled her brazen Jewish exceptionalist mentality during a visit to the Jewish Holocaust Centre in Melbourne in 2012, where she stated that the holocaust was “the greatest crime humanity has ever known.” It is unlikely that Gillard is unaware of the more than 60 million non-Jews who perished during the Second World War, or of the millions of Russian and Ukrainian Christians killed by Jewish Bolsheviks throughout the 1920s and 1930s. Revealing her callous and cold-blooded outlook, Gillard ignores those victims because recognizing their suffering would undermine the racist Talmudic myth that Jews are the world’s ultimate and perennial victims. The reaction of Australia’s Zionist lobby to Bob Carr’s revelations has been predictably lame. The Zionist kingpin Mark Leibler of the Australia Israel & Jewish Affairs Council dismissed Carr’s exposition about “The Lobby” as a “figment of his imagination.” When faced with truths about their undue influence, the Zionists merely sneer at and heap ridicule upon those like Carr who are brave enough to state the obvious. Former American politicians have expressed similar sentiments to Carr’s. Cynthia McKinney, a former congresswoman from Georgia, said that she was ousted from congress by the Israeli lobby because of her outspoken support of the Palestinians. She once told an interviewer that 99 per cent of members of the US congress are veritable servants of Zionist interests. Former congressman Paul Findley wrote a book about the enormous power of Israel’s lobby in the US entitled They Dare to Speak Out: People and Institutions Confront Israel’s Lobby. The very fact that discussing Zionist influence is taboo in Western societies is in and of itself an indication of their pervasive power. “To find out where the power lies, ask whom you cannot criticize,” as the wise credo goes. The unusual dichotomy that Zionists like Stein and Nehorai are able to say the things quoted above without any repercussions, while non-Jews who have made comparable assertions are castigated as anti-Semites, haters and conspiracy theorists, underscores the Talmudic double standard that permeates much of public discourse on this important issue. However, the tide is slowly but surely turning, and it is becoming increasingly apparent that the Zionists cannot keep a lid on their intrigues any longer. Readers can send contributions to martinezperspective[at]hotmail.com on PayPal or click the button below.